The Chalet was well appointed with great views. It all the equipment needed including a Fondue set which we used. Our guests were very pleasant! Thank you very much for pointing out the fondue dishes here! Fantastic view. Lovely, clean accommodations. Had a wonderful stay in the mountains. Bel appartement agréable avec magnifique vue car perché dans les hauteurs de jaun. 2 chambres agréables et grande pièce principale, idéal pour une famille. Départ de randonnées à côté de la maison. Une évaluation positive, considérée comme peut-être plus la norme des installations de l'appartement, non? 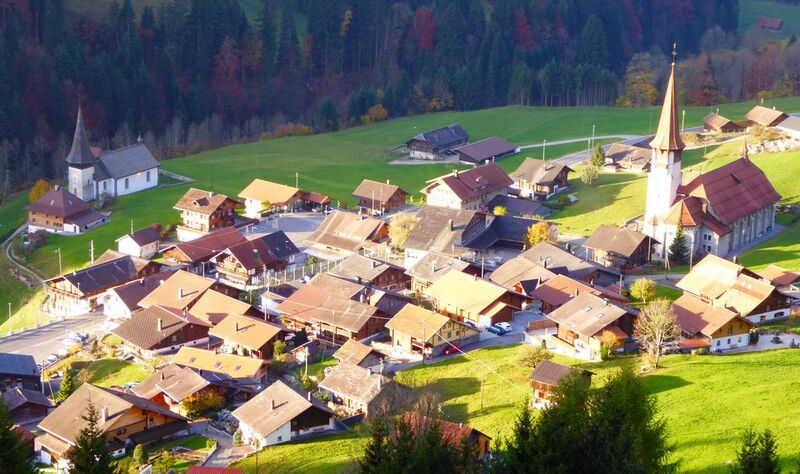 Jaun is a little and charming village in the middle of the mountains and the Chalet Barbara is a nest of comfort! Quiet, well equiped, spacious and with a gorgeous view, we really appreciated our stay! This property is exactly as described and pictured. It's actually a bit better since there is an extra shower and sink in the second bedroom. Also, the views are much better than the pictures reveal. The house was very clean and well maintained. The owner met us there and showed us around. He was very helpful and recommended places to shop and dine. The village is very quiet and quaint but there is much to do in the neighboring areas. We went to the Gruyere cheese making facility and the Nestle chocolate factory. We also drove over the Jaunpass to Gstaad for the day. If you want to escape from the hustle and bustle of everyday life, then this is your place. We will hopefully return to this house the next time we're in Switzerland. Jaun (1.000 m) is located approximately 75 km south of Bern. Towns such as Gstaad, Thun and Montreux (Lake Geneva) can be reached by car in a maximum of 3/4 hour. Achtung: Vermietungen von weniger als 3 Nächten nur auf Anfrage und auf besonderen Wunsch Bei der Buchung von 2 Personen ist das Studio mit Dusche n i c h t eingeschlossen! Sie können es für 10 Euro pro Nacht zusätzlich buchen. Endreinigung (Euro 55) entfällt bei längerer Mietdauer (ab 17 Tagen). Weitere Kosten: Auf Wunsch: Bettwäsche und Handtücher: CHF 20 pro Person pro Woche Ab 17 Tagen Aufenthalt günstigere Konditionen. Langzeitmieter (ab 5 Wochen) erhalten ein besonderes Angebot. Fragen Sie einfach an.